OBD II fault code P0340 is a generic code that is defined as “Camshaft position (CMP) sensor “A”, bank 1 – circuit malfunction”, and is set when the PCM (Powertrain Control Module) detects an electrical problem in the control circuit of the camshaft position sensor labelled “A”. Note that although sensor “A” typically refers to the position sensor of the intake camshaft, not all manufacturers follow this convention. “Bank 1” refers to the bank of cylinders that contains cylinder #1 on V-type engines. The function of this particular camshaft position sensor on Nissan applications is to monitor the position of the intake camshaft relative to cylinder #1, in order to provide the PCM with accurate data with which to calculate appropriate ignition-timing strategies. This is particularly important at engine start-up, when the position of cylinder #1 determines the moment when the first ignition spark is delivered to start the engine. In addition to the above, input data from the camshaft position sensor is also used to calculate fuel injection timing, as well as to verify the position of the crankshaft and supply information on engine speed. On applications with variable valve timing, the camshaft position sensor is used to verify that a rotation of the camshaft had indeed occurred when such a rotation to vary the valve timing had been commanded by the PCM. From the above it should be clear that the camshaft position sensor fulfills several roles, all of which are critically important to efficient engine operation. Thus, if the PCM detects any electrical failure, malfunction, or defect in the camshaft positions sensors’’ control and/or signal circuits, it recognizes that it cannot control one more critical engine management functions efficiently, and it will set code P0340 and illuminate a warning light as a result. Why does code P0340 affect Nissan applications more than others? In the early 2000’s, a major cause of this code on many Nisan applications was poorly designed, unreliable camshaft sensors that usually failed without any advance warning. However, some Nissan applications, and most notably the 1.0L engines found in Nissan Micra models suffered from this code as the result of unreliable, and/or poorly designed timing chains that stretched to beyond the point where the additional slack could be absorbed by the chain-tensioning device. While the camshaft sensors on these engines might work perfectly, the slack in the timing chain cause the camshaft to run out of phase with the crankshaft, which causes code P0340 to set. Interestingly, many other Nissan applications with timing chains suffered (and still do) from the same problem, and many dealers still refuse to replace camshaft position sensors unless the timing chain, sprockets, guides, and tensioners are replaced as well. Thus, in cases of recurring camshaft position sensor failures, or cases where replacing the sensor does not resolve the problem, it is likely that the timing chain is stretched to beyond a maximum allowable limit. Where is the P0340 sensor located? 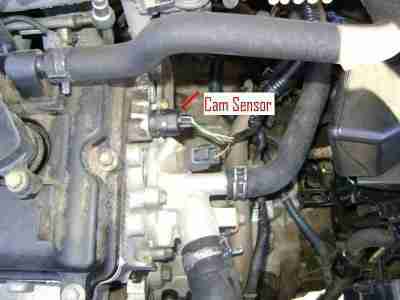 The image above shows the location (labeled) of the camshaft position sensor on a Nissan XTrail T30 model. Note though that the appearance and location of camshaft position sensor vary between applications, so refer to the manual for the affected application to locate and identify the camshaft position sensor correctly.